Slow Down, Sell Faster! shows you how to stop jumping the gun and work with your customers to identify and quantify their real needs, so by the time you begin your pitch in earnest, you're already halfway home. Featuring a simple yet powerful eight-step process and practical, repeatable techniques, Slow Down, Sell Faster! is packed with examples from the author's extensive experience, plus research on customer buying processes — rather than traditional selling processes. 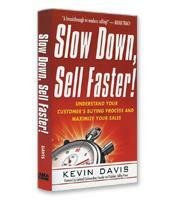 A selling model that is built around the customer’s buying process. The four questions you need to ask to win a complex sale. The eight sales roles that correspond to the steps in the customer's buying process. Tips for sales managers to effectively coach the eight sales roles.